Brewers 4, Angels 2 ~ The Bucky Channel - The World of Sports from Wisconsin's Perspective. The box score doesn't lie my friends. If you look closely, right next to Chris Capuano's name, is a W. Chris Capuano with a win ladies and gentlemen!!! Some good Sunday afternoon baseball played by the Crew today. Cappy did give up two runs that put the Brewers in a hole, but they rallied in the 4th getting RBI's from Abraham Nunez and Laynce Nix. Cappy gets the win, and the bullpen went scoreless the rest of the way. Guillermo Mota gets the save. 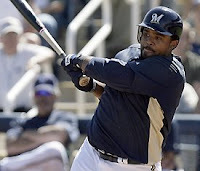 The main story that came out of Brewers camp today though was that he is unhappy about his new $670,000 contract. Prince was hoping for at least $900,000, but the Brewers are sticking to their script and offered him just shy of seven hundred thousand. There is speculation that this may cause some bad blood when the Brewers try to sign him long term, but I don't think that's a problem. Prince will get his due, and call me optimistic but I feel good about him staying with the Crew for years to come.